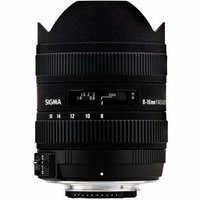 The Sigma 8-16mm f4.5-5.6 DC HSM Lens is an ultra wide zoom lens with a minimum focal length of 8mm, designed specifically for APS-C size image sensors, where it gives focal lengths equivalent to 12-24mm (35mm format) and an angle of view of approximately 114.5-75.7 degrees. The Sigma 8-16mm features 4 low dispersion glass elements to compensate for colour aberration, while one hybrid aspherical lens and two glass mould elements give excellent correction for distortion and astigmatism. The Super Multi-Layer Coating reduces flare and ghosting while superior peripheral brightness ensures high contrast images throughout the entire zoom range. The Sigma 8-16mm f4.5-5.6 DC HSM Lens incorporates an inner-focussing system and a Hyper Sonic Motor, ensuring quiet and high speed AF as well as full-time manual focus capability. With a minimum focusing distance of 24cm throughout the entire zoom range the 8-16mm lens allows the photographer to emphasise the subject by creating exaggerated perspectives.